The Australia’s 457 subclass visa has been the most easy and common way for employers to employ and invite the skilled workers to Australia on temporary basis. The subclass 457 was introduced in 1996 to entice the skilled professionals. The number of visas issued under the subclass is uncapped, and touched a peak of 126,000 during the year 2012-13. The Australian Prime Minister, Malcolm Turnbull has announced that he and his government will be ‘putting Australians first’ to give them the precedence for the employment opportunities which are presently vacant and are open for the immigrant workers to take. 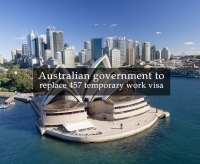 The Turnbull administration has decided to substitute the skilled 457 visas with a new subclass to provide the citizens of Australia with the priority for the jobs in Australia.